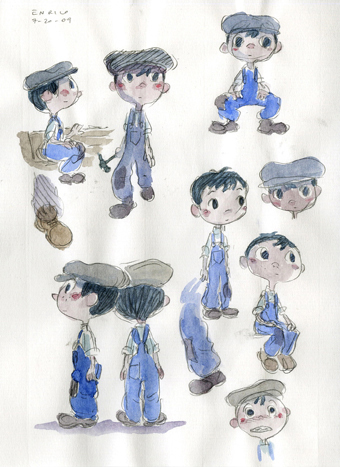 There are three characters in "La Luna": a boy, his father, and his grandfather. At first glance, they are cut from the same mold. They wear overalls and hats; they carry brooms. But the contrast between them reveals their characters. Covered by the signs of age, the two adult men’s eyes cannot be seen. Nor can they see as clearly and widely as the boy, whose large eyes are unobstructed and clear. The grandfather moves his traditional broom with precision; the father wields a push-broom for increased efficiency. Both argue in front of the timid boy, whose curiosity and sense of wonder eventually lead him to discover joy. Enrico Casarosa wanted to create a different look from past computer-generated films. “Computers have a way of making things look perfect,” he said, “and we wanted to make it look different.” He wanted to bring the warmth of human imperfections back into his world. He chose to reintroduce handmade textures and color variations by scanning watercolor paintings, then applying them onto the geometry. Every plank on the boat got this treatment. And for the backgrounds, he used watercolor paintings directly as matte to provide a theatrical, handcrafted backdrop.